A Link Monster (Japanese: リンクモンスター Rinku Monsutā) is a type of Monster Card. The color of their card frame is dark blue, which is similar to that of a Ritual Monster, but with a hexagonal pattern similar to a honeycomb structure. These cards are placed in the Extra Deck. Like other Extra Deck monsters, Link Monsters cannot exist in either the hand or the Main Deck (even with card effects). If a Link Monster would be moved to the hand or Main Deck, it is returned to the Extra Deck instead. 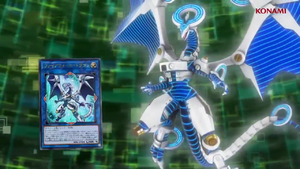 If a card like "Transmigration Break" or "Degenerate Circuit" is applying, the Link Monster would be banished rather than returning to the Extra Deck. If a Link Monster is not Link Summoned first, it cannot be Special Summoned from the Graveyard or while banished (unless it specifies another way to properly Special Summon it). Link Monsters have a Link Rating in place of a Level or Rank. A Link Monster's Link Rating determines the total number of Link Materials required to Link Summon it. A Link Monster's Link Rating is also equal to the number of Link Arrows it has. A Link Monster's Link Rating can be found next to its ATK, in place of the traditional DEF value. Link Monsters do not possess Levels or Ranks, therefore they cannot be used as material for a Ritual, Synchro, or Xyz Summon. Also, Level or Rank-modifying cards such as "Harmonic Waves", "Feedback Warrior", or "Xiangsheng Magician" do not affect Link Monsters. The same thing can be said for Spells/Traps that affect Levels/Ranks such as "Gravity Bind", "Level Limit - Area B" or "Planckton". Link Monsters can only exist in face-up Attack Position (they do not have a DEF value) and cannot be placed in or changed to Defense Position (either manually or through a card effect); this is because rotating the card into Defense Position would change the directions its Link Arrows point to. Because of this, Link Monsters are unaffected by effects that change battle positions and are unable to be placed face-down, and cannot be Summoned by an effect that would Special Summon monsters only in Defense Position (such as "Back to the Front"). Link Monsters also have Link Arrows, indicated by red arrows radiating outward from the art frame. These indicators denote which zones and monsters that Link Monster points to. Monsters in the Extra Deck (Fusion, Synchro, Xyz, face-up Pendulum, and Link Monsters) can be Special Summoned from the Extra Deck to a Main Monster Zone a Link Monster points to. If a Link Monster points to a monster, the monsters are considered to be "linked" to each other. A Link Summon is the act of Summoning a Link Monster from the Extra Deck using the requisite number of Link Materials listed on its Link Rating. During the Main Phase, the turn player can Link Summon by sending the face-up Link Materials from their field to the Graveyard. Link Monsters commonly grant benefits to monsters they point to or gain more powerful effects depending on the number of monsters they point to. As such, Decks focused around Link Monsters require methods to quickly Summon monsters in order to Summon Link Monsters as well as into the zones where the Link Monsters point to. When attempting to Summon multiple Link Monsters, it is important to decide which order to Summon them in, as their Link Arrows will dictate where the others can be Summoned and what monsters will be Linked to them. Link Monsters with higher Link Ratings can be Special Summoned more quickly by Link Summoning multiple weaker Link Monsters first. This also helps to place them in locations that will take better advantage of their Link Arrows. Powerful Link Monsters are typically balanced by having a higher Link Rating and forward-pointing Link Arrows, allowing the opponent to summon more Extra Deck monsters. For example, "Decode Talker", "Firewall Dragon", "Topologic Bomber Dragon" and "Encode Talker" all have Link Arrows that point towards the opponent's field when they are placed in the Extra Monster Zone, while weaker Link Monsters such as "Missus Radiant", "Gaia Saber, the Lightning Shadow" and "Link Spider" do not.